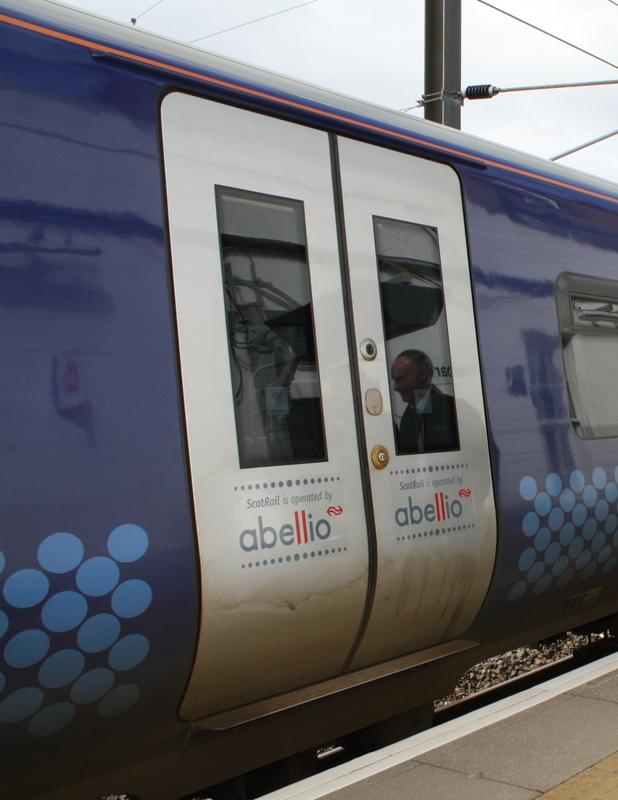 Class 380 at Dunbar showing new notices on train doors announcing the operator as Abellio. Class 380 EMU at Dunbar with a CrossCountry train passing on the fast line. Karen Boswell, MD of East Coast on the occasion of her visit to Dunbar to meet with RAGES on 19 March 2012. First day of service of 380 on 11/06/2011 pictured at Waverley. 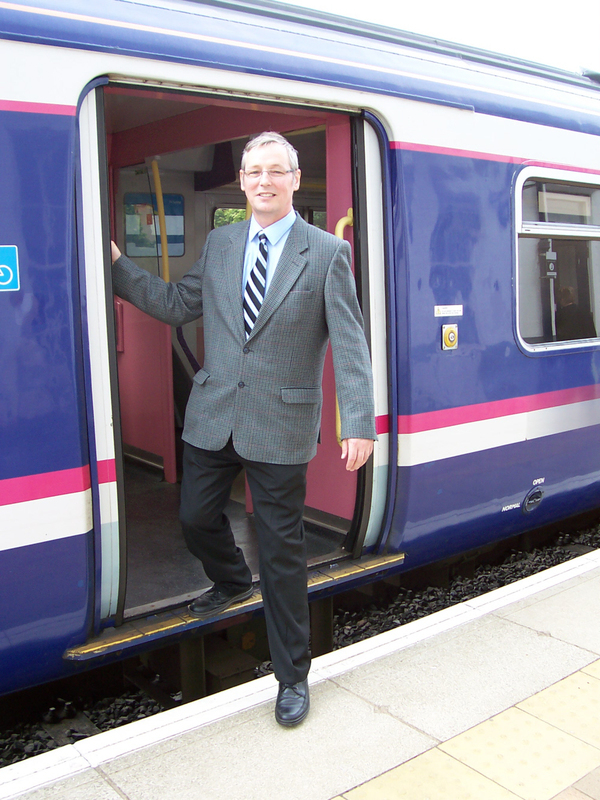 Our chairman, Tom Thorburn alighting at Dunbar from the first ScotRail train on 24/05/2010 for over 20 years when most of the Committee joined him. First ScotRail train to Dunbar on 24/05/2010 pictured at Waverley. 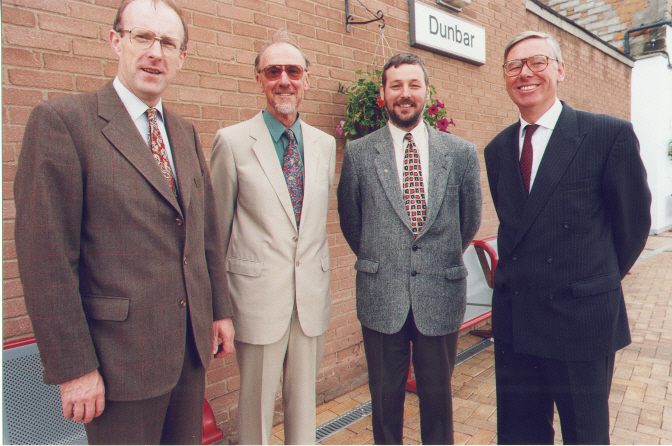 A re-furbished Dunbar station was officially opened on 19 July 1999 by the then MSP John Home Robretson (left). Barrie Forrest has written to David Horne, Managing Director of LNER, saying that it had been brought to his attention of a rumour that Dunbar was soon to lose its LNER service. With more houses being built in the town and the increasing population using the rail services, it is essential that LNER services are maintained at Dunbar. Indeed, RAGES has been campaigning for extra stops. Mr Horne has replied saying that it "sounds like a myth" and LNER are not planning any such changes. 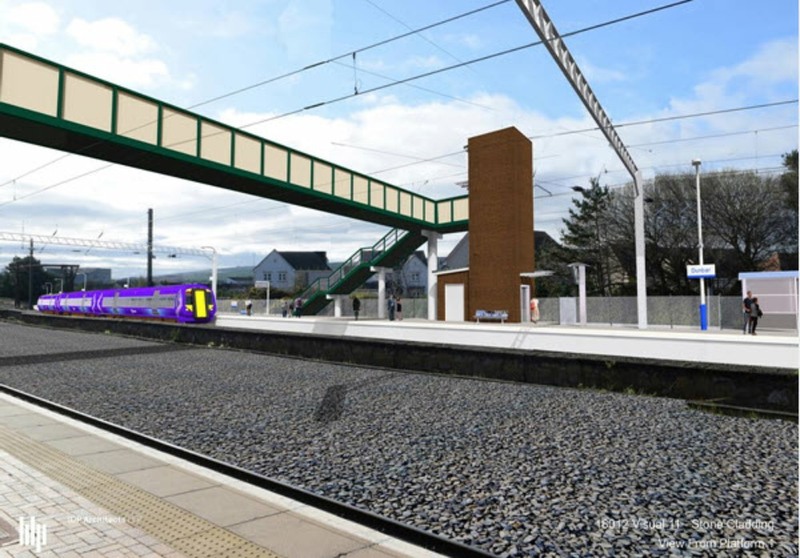 RAGES has been informed about Network Rail’s plans to construct a new platform and footbridge with lifts at Dunbar station as part of the Scottish Government’s continued investment in the railway. Network Rail has recently appointed a main contractor, Amco, to undertake these works. Over the coming months detailed design work will be undertaken by Network Rail and Amco. Engineering work is expected to start next summer with the new infrastructure completed in early 2020. In the new year Network Rail will write to stakeholders and the community to invite them to community drop-in sessions which will be arranged prior to the commencement of construction. The drop-ins will provide an opportunity to view the plans and speak to members of the project team for more information. The construction of the new platform will provide additional capacity, improved operational flexibility and support a potential journey time improvement for some northbound services on the East Coast Main Line. The image opposite is from Network Rail's press release. 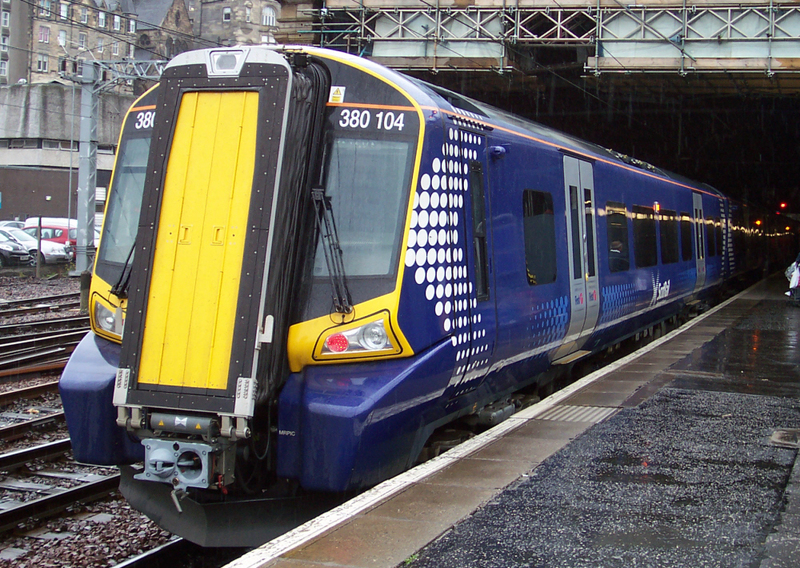 On 24 May 2010 First ScotRail started the new Monday-Friday services. A further return service around lunchtime was offered from the December 2010 timetable. 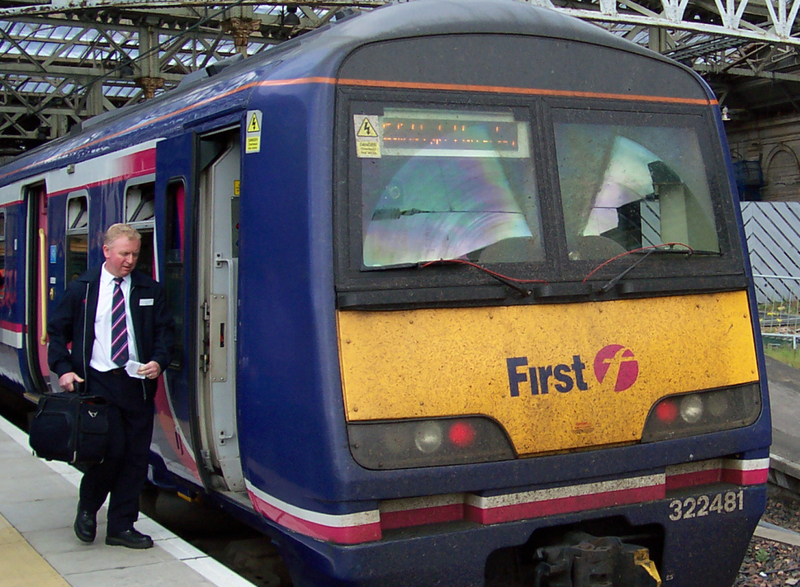 From December 2010, ScotRail began running the 23:17 Edinburgh to Dunbar on a Friday. In the May 2011 timetable, ScotRail introduced a 16:33 Edinburgh to Dunbar and 17:02 return service and all their Dunbar trains now stop at Musselburgh. 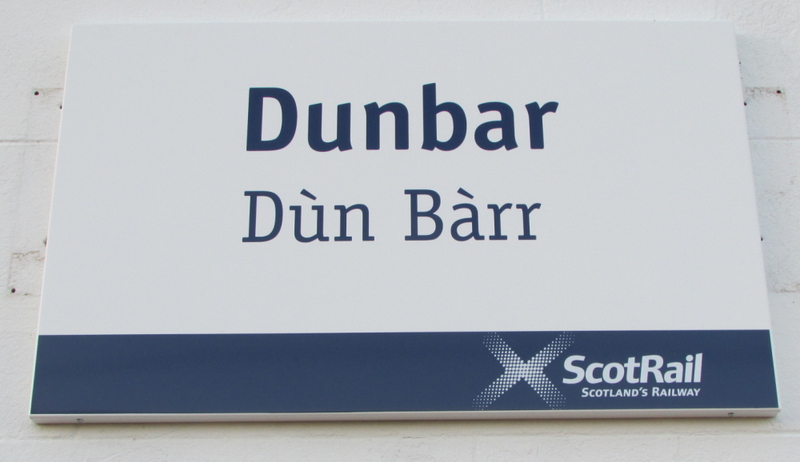 From December 2011, ScotRail have added a further service at 22:06 from Edinburgh to Dunbar on Saturdays only. This was a vast improvement on the previous last train at 19:00 by East Coast. East Lothian Council, RAGES and Sustaining Dunbar organised a public meeting in Dunbar to offer further information for inclusion in the study as reported in The Rages Rag Issue 47. From Saturday 15 December 2011, new Edinburgh to Dunbar Saturday services started which matched the weekday one. All stop at Musselburgh. 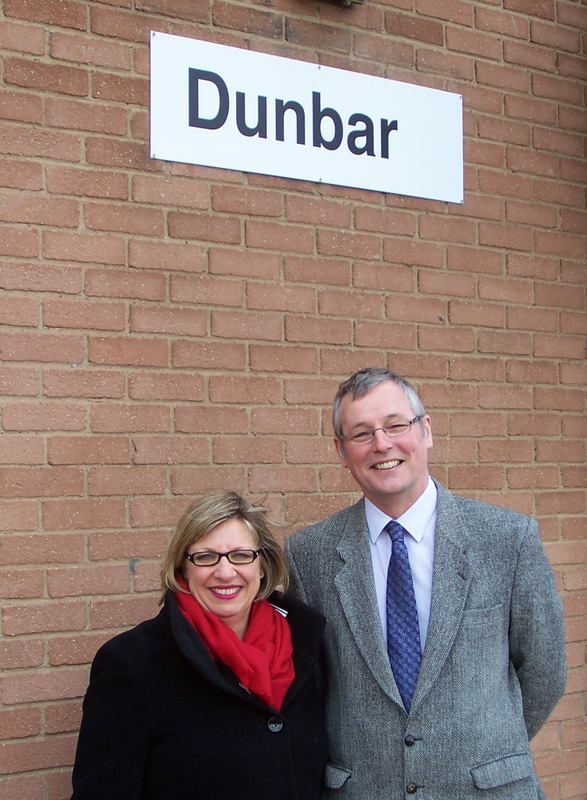 When the new local service is introduced, Dunbar will benefit with extra trains in the early morning and later at night with the two-hour service. 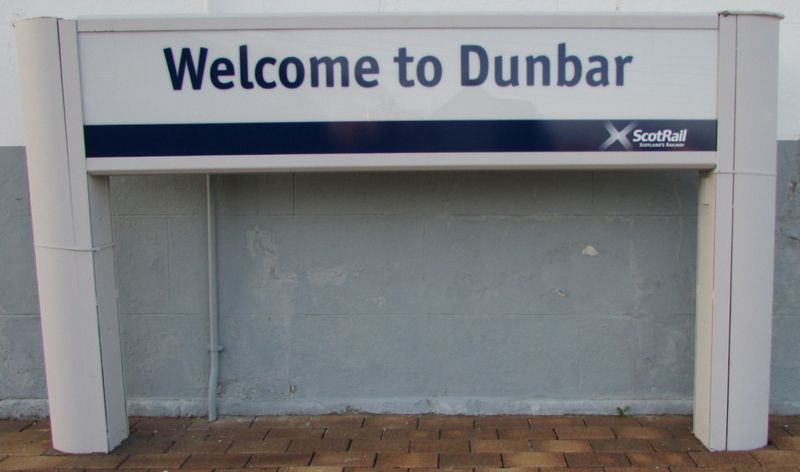 Dunbar station came under the ScotRail management on 1 July 2015. Re-branding of the station has started as can be seen in the photographs opposite. 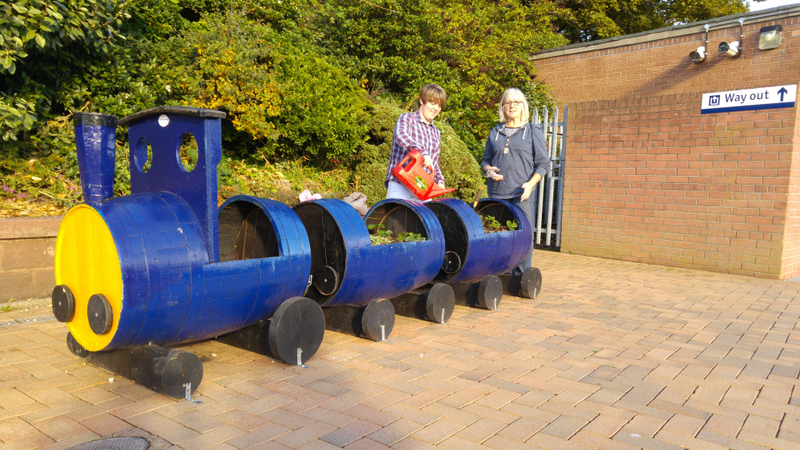 Volunteers at Dunbar station have planted up the new train barrel planter recently placed on the station platform by ScotRail, as seen in the photograph opposite (courtesy of John Yellowlees). After RAGES pursued ScotRail for replacement of the often non-working ticket machine as well as a second one, both of these have now happened. Sundays only 08:45 Newcastle to Edinburgh, calling at Morpeth 09:00, Alnmouth 09:16, Berwick 09:40, Dunbar 10:04 and Edinburgh 10:28. RAGES are grateful for these new services and will continue discussions with Virgin Trains East Coast to have a mid-morning Edinburgh to King's Cross train call at Dunbar and a mid-morning to noon King's Cross departure service call at Dunbar. At the meeting with the Minister for Transport on 8th February 2017, RAGES raised the following two points about fares and additional services at Dunbar. Fares at Dunbar, which is a ScotRail station, are set by Virgin Trains East Coast. This is grossly unjust given that ScotRail have just increased their fares by 1.9% whereas VTEC increased Dunbar passengers' fares by 5%. In addition, these passengers are unique in that they have to pay £4 to park their cars, unlike passengers from the other six stations in East Lothian. Also there are no off-peak fares available from Dunbar, again unlike the other ScotRail stations. RAGES asked the Minister to have this situation addressed in favour of Dunbar station passengers. Also, Dunbar station requires additional services for this rapidly expanding town. Our passenger statistics show that there are in excess of 460 passengers boarding the first three Edinburgh bound services (07:00, 07:42 and 08:56). Given that there are now another 1500 houses planned for Dunbar, this further reinforces the need for additional services – especially early morning services. These services should be provided by a ScotRail service which will have the additional benefit of protecting paths required for East Linton and Reston stations and relieving overcrowding on trains that serve Wallyford and Musselburgh. RAGES therefore asked the Minister to have additional ScotRail services provided for Dunbar. The Minister has replied to these points and his comments can be seen in The Rages Rag issue 68. Of note is his authorisation to build a second platform at Dunbar and the possible extension to car parking. More information on the second platform and on the new Azuma Virgin Trains can be found in The Rages Rag issue 69. In pursuit of extra long distance services at Dunbar, RAGES has put forward suggestions to CrossCountry in response to their Timetable Consultation. RAGES are to meet CrossCountry in October 2017 to discuss our proposals.